What’s the plural of aprium? And a note on crop diversity. I’m struggling with language here, so any advice is appreciated. An aprium is a new fruit variety, created by Zaiger Genetics. It’s 3/4 apricot and 1/4 plum, just the reverse of a pluot, also developed by Zaiger Genetics. (Before rambling on about my garden, I should mention that the SF Chronicle had a nice article on the Zaiger family a few days ago. I visited their farm a few years ago while on a tasting tour and met them. They’re good people, and a great model of a successful and dedicated family business.) So, for the plural of aprium, should I use what sounds like the scientific plural (aprii) or go with a more popular sounding choice (apriums)? I find myself using both. OK, let me put an ecological slant on my aprium tree, since ecology is the them of this blog (see how I neatly avoided using the plural?). I’ve posted before on how backyard food production differs from commercial production. Instead of monocropping with massive amounts of just one or a few crops, backyard production is best served by having small amounts of a large variety of crops. My aprium has served me well in this regard this year. After a large crop of apricots last year, I thinned my apricots aggressively this year. About a week later, we had another spring storm that knocked most of the remaining blossoms off the tree. 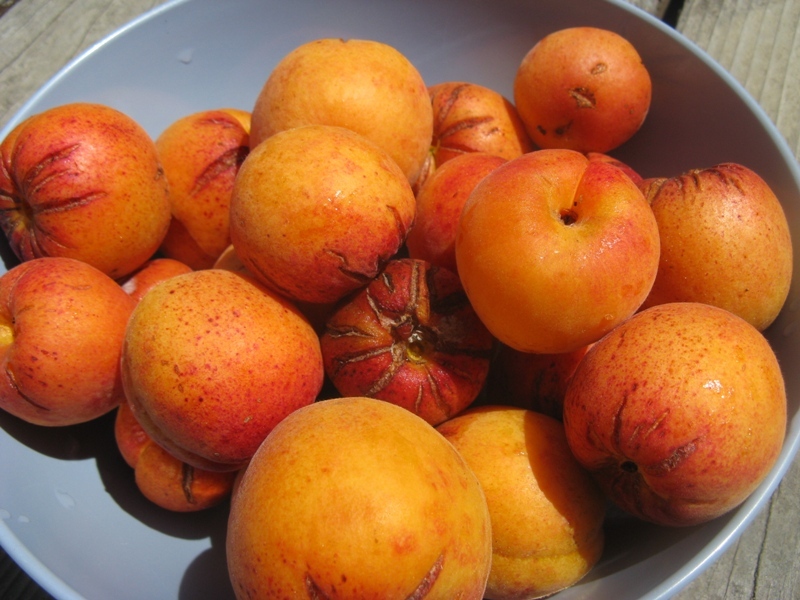 Net result: I have two apricots on my tree this summer. But, having let my aprium produce some fruit this year for the first time has paid off. I’ve had a small but good harvest of aprii this year (ooops, had to use the plural). They’ve filled in nicely for the “missing” apricots. The point? Crop diversity is very important if you want to have a regular supply of food. There’s certainly a lesson here for industrial agriculture, since loss of a single crop that is the only crop, means losing lots of money. Just as biodiversity in an ecosystem means a more stable ecosystem, crop diversity means a more stable farm income. That’s the way it used to be on family farms, but industrial-scale agriculture has changed that. If my distant memories of Latin lessons are anything to go by, you would have one aprium and two apria (just as you have a singular medium and plural media) for a neuter noun. But why not ask the Zaiger family what they say, because it is their creation, after all? Interesting post, thank you.